Posted on June 12, 2009 at 1:17 pm. Come shred the streets with us this Sunday June 21st, for Go Skateboarding Day. 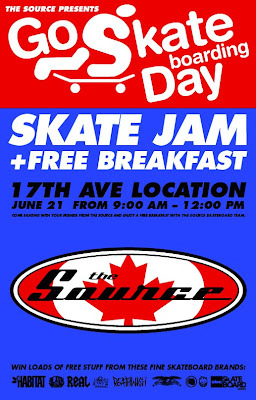 To celebrate, we’re throwing a SKATE JAM behind our 17th ave location. Enjoy a FREE breakfast and come skate with the Source skateboard team. We’re firing it up at 9:00AM and it goes until 12:00PM. Loads of free gear from your favorite brands will be getting passed out. We have you covered when you’re taking over the streets this Sunday! It’s father’s day so don’t forget to bring your pops along.